Prominent Human Rights Activist Dr.K.Balagopal Passes Away – Condolence Message. 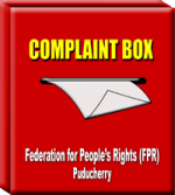 – Federation for People's Rights (FPR), Puducherry. Prominent Human Rights Activist Dr.K.Balagopal Passes Away – Condolence Message. Federation for People’s Rights (FPR), Puducherry express deep heartfelt condolence for the sudden death of Dr. K. Balagopal, a prominent Human Rights Activist of India and it is a great loss to Human Rights Movement. 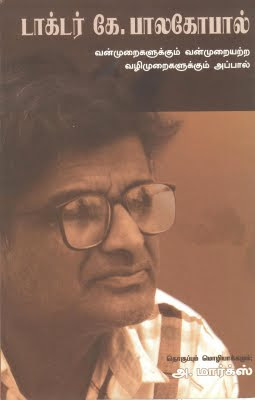 Dr. K. Balagopal, was born in Anantapur District in Andhrapradesh, obtained Doctorate in Mathematics and worked as a lecturer in Kakatia University at warrangal. After leaving his job he dedicated to Human Rights as full time activist. On 8th October 2009, night, due to chest pain, he was taken to a private hospital at Hyderabad and the Doctors there told that he was already dead. As General Secretary of “Andhrapradesh Civil Liberties Committee (APCLC)”, he struggled against the state oppression on Naxalite movement. He also concentrated in fighting against the Custodial Violence, Fake Encounter killings and Abolition of Death Penalty. Since, he had confident opinion against any form of violence; he developed difference with naxalite movement and quitted APCLC. Then founded “Human Rights Forum (HRF)” and continued his service on Human Rights. He worked for more than 10 years as lawyer at Andhrapradesh High Court at Hyderabad and argued to get a historical Judgment on fake encounter that if an encounter occurs, a case should filed under Section 302 IPC against the police personals who involved. He was a left intellectual and his uncompromised and honest writings were well recognized by the intellectual community around the world. I am closely associated with him from 1992 and in 1996 I was a member in an All India Fact Finding Committee and facing high risk from Police toured with him in naxalite prone four districts of Andhra to probe fake encounter killings. In 1998, his voice is the first against the Death Penalty, while 26 persons were awarded Death Sentence in Rajiv Gandhi murder case. Consulting with him, we organised a two day All India Conference in Puducherry for Abolition of Death Penalty in India. I also participated in an All India Fact Finding Committee with him to probe the violence against Christians in Orissa and Karnataka. This is the last moment I met him. He concentrated and fought for the poor Tribal people, who were affected by the projects of Special Economic Zones (SEZ) in his last period. The people of different walks of life of Andhra including the political leaders of Congress and Marxist – Leninist Parties condoled for his death. I deeply convey my heartfelt condolence to the family members and associates of Dr. K. Balagopal.